The show airing June 4, 2018 – June 11, 2018 ‘highlights’ the 14th Annual FestivALL Charleston. We interviewed Brittany Javins, Director of FestivALL Charleston. We discussed the highlights of the event, what it means to Charleston, both artisically and economically, and why it is so important. The mission of FestivALL Charleston is to create, produce and present vibrant arts experiences and entertainment opportunities, and also serve as a catalyst for others in the community to do the same. FestivALL is know for it’s mult-arts, multi-venue summer festival and mini fall festival when a “City becomes a Work of Art”, but how else does FestivALL contribute to its community and the local and state economies. 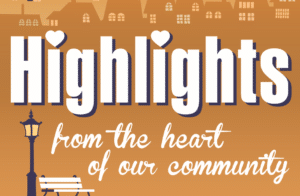 Brittany highlighted the Mayors Concert, Dance FestiALL, Smoke on the Water Chili Cook-off, Art Parade, Ice Cream and the Arts in Elk City, Moses Live on the Levee, Carriage Trail, and many more. She encouraged all to go to web site and coordinate their schedules. 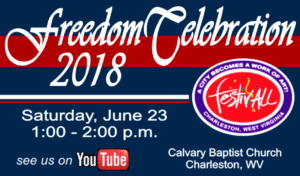 We also interviewed Barry Skeenes, Musical Director, Calvary Baptist Church regarding the FestivALL’s 4th Annual Freedom Celebration Concert. The concert is a tribute to God and Country on June 23, 2018 from 1-2:00 at Calvary Baptist Church on Maryland Avenue, Charleston WV. Barry talked about their partners Edgewood Summit and CORE. Fans can review last year’s concert on You Tube by clicking here. Call the church at 304-343-4391 for more information.